There are two things that i would like to discuss here, that are related and so there's no need to open two separate topics. The jivatman being an upadhi or limiting adjunct to Ishwara, the upadhi is also called the Purusha. Jivatman can surely be considered as an upadhi, but if you ask me, jivatman should be an upadhi to Nirakara Brahman and not to the saguna Ishwara. I mean, its nirakara brahman who manifests as the gross mind/body (upadhis) and then starts recognizing ITSELF as the mind/body (upadhis), and ends up being called as the jivatma aka jiva. But saguna or Ishwara never thinks of himself as the upadhis. Infact its beyond maya and its products like mind/body, which are the upadhis. 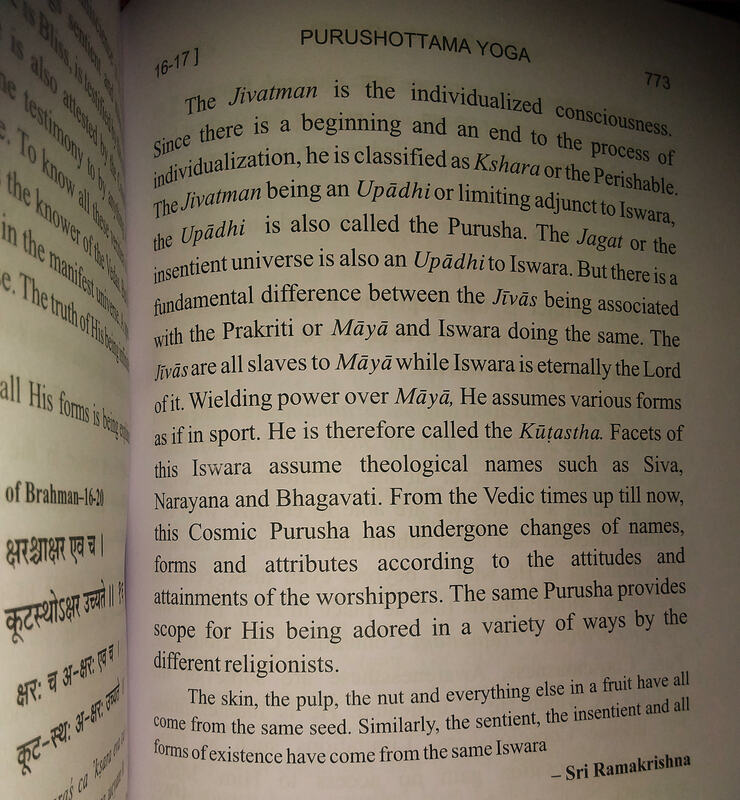 Then, the next point is, you can clearly see in the quoted text, that he calls this jivatma as the purusha. But then later, in that same commentary, (not included in quotes, check the image attachment) he says that purusha is God. To him there are two Purushas. One is the jiva/jivatma and the other is the cosmic being, the saguna god. There are 2 questions here. Is jiva an upadhi of Nirakara Brahman or saguna Brahman? Partial answer: One cannot even think of jiva or Isvara when thinkng of Nirakara Brahman. They become undefined since Nirakara Brahman is all that exists. A fuller reply will be given relative to the second question. Do Advatins consider two types of Purusha? Let me first post two relevant verses from Pancadasi which explain Isvara and His relationship with Jiva..
Sruti says that this (pure universal) consciousness reflected in Maya is Isvara which controls Maya as well. The great Isvara is the inner ruler, omniscient, and cause of the universe. The Sruti, in the passage beginning with 'the consciousness in the deep sleep' and ending in 'He is the Lord of all' describes this 'sheath of bliss' as the Isvara. Vide Mandukya Up. 5-6, Brhadaranyaka Up. 4.4.22. Here Isvara is the consciousness reflected in the totality of bliss-sheaths. It has been stated above that Isvara is the reflection of consciousness in the Vasana, and as the bliss sheath is nothing less than such a reflection, it is called Isvara. This, however, is a concession to those who cannot comprehend the higher conception in the beginning. Here the author clearly says that this 'sheath of bliss' is Isvara. Much dust of controversy, as over the previous sloka, has been raised over this statement. The point, however, is this: A Jiva is a reflected consciousness individualised, and Isvara is the reflected consciousness of the totality. Now can there be totality without individuals? So Isvara must of necessity, include Jivas. In each drop of Ganges water the Ganges abides, and yet all the drops severally do not constitute the Ganges, which over and all of them is a unity. Each individual soul, Jiva, has three states of consciousness, the waking (when the Jiva is called the Visva), the dreaming (when he is called Taijasa) and the deep sleep (when he is known as Prajna). Isvara, the collective consciousness, has also three corresponding states - the Vaisvanara, the Hiranyagarbha, and the Isvara. Isvara being omnipotent, each of these three states includes within itself the corresponding states of the individual souls. Just as the three states of a Jiva do not make him three, even so the three states of Isvara do not make up a triple personality. Just as Prajna, being the causal state of a Jiva, includes the other two states of his and is the guide and controller of them; so the third state of Isvara, being the causal one, is the source, the indwelling Spirit, controller and guide of the other two and through them of the entire universe. The 'sheath of bliss' is the causal state of a Jiva. But is not the universal cause Isvara, as well in a deeper sense? A spot in India is also a spot in the continent of Asia, in the globe, as well as in the universe.There is a great layer of ignorance when we attribute it only to India and not the universe. The individual 'sheath of bliss' is only a portion of the universal 'sheath of bliss' and when the individuality and all the Vrittis vanish, how is one to distinguish between the individual and the universal? The fact of returning to the individuality in the later waking state is no bar to its previous merging in the universal - diversification starting on the return journey when one comes down to 'I'-consciousness, left long behind. The Isvara may be thought of as the sum total of all purushas while Jiva is the individual component of Isvara. Not the answer you're looking for? Browse other questions tagged advaita jiva purusha .